30 million years of life, originally uploaded by EcoSnake. Recent discoveries of various peptides comprising Gila monster (Heloderma suspectum) venom indicate remarkable potential in treating human diseases. 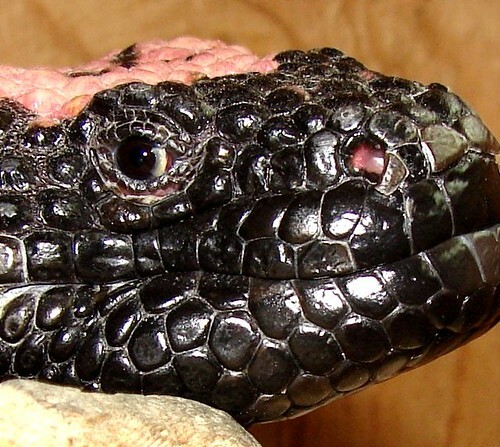 Peptides in Gila monster venom are now treating type II diabetes (approved by FDA in 2005). Other peptides in Heloderma venom have potential of improving memory, and inhibiting growth of lung cancer cells. These discoveries call our attention to the potential of all the diverse life forms in the world’s ecosystems to secure the future of humans and all life on our planet. Approximately 800 species of snakes and 2 species of lizards (Gila monster and beaded lizard) are venomous. The two species of venomous lizards belong to one family, the hemodermatidae and one genus, heloderma. The venomous snakes are the highest snakes on evolutionary ladder, dating to around 30 million years ago. Venom basics – a modified form of saliva – hemotoxic and neurotoxic – qualities which vary among individual species — snakes use venom for subduing and digesting prey. Lizards use venom for defense. A brief history of venom research – 1664 Francisco Redi, physician to Duke of Tuscany proved that head gland secretions of European Adders caused effects of snakebite, contradicting theory that harm came from “enraged spirits” of the serpents. In 1887, Henry Sewall at the University of Michigan, following Louis Pasteur’s success with a rabies vaccine, immunized pigeons against pit-viper venom. Gila monsters have an extremely slow metabolism. They spend the majority of their time sleeping in burrows. They move from burrow to burrow in relation to seasons and location of sun. Gila monsters use their venom for defense, not for subduing and digesting prey as do snakes. Venom is produced from glands in the lower jaw and is delivered through grooves in the lizard’s teeth when the lizard bites and chews on an object. Hence, the nickname, “lizard spit.” Unlike snakes, Gila monsters do not have fangs. When Gila monsters bite they do not let go easily. Gila monster venom is toxic but not lethal to humans. There is no antivenin. Bites are extremely painful. In mammals, major effects of venom include rapid reduction in blood flow followed by marked fall in blood pressure, respiratory irregularities, hypothermia, edema and internal hemorrhage in gastrointestinal tract, lungs, eyes, liver and kidneys. a. Gilatoxin appears to lower blood pressure in rats. b. Helospectin (exendin-1) shows physiological effects to Vasoactive Intestinal Peptides. c. Helodermin (exendin-2) appears to inhibit growth of lung and breast cancer cells. d. Exendin-4 (exenitide) stimulates insulin production and is now approved as treatment for Type II Diabetes. e. Gilatide improves memory in rodents. History of development of exenatide: Discovered in 1980’s by Dr. John Eng an endocrinologist at the Solomon A. Berson Research Laboratory, Veterans Affairs Medical Center, Bronx, New York. Dr. Eng discovered a hormone in the venom of the Gila monster which he named exendin-4. He published a paper on exendin-4 in a 1992 issue of The Journal of Biological Chemistry. The VA did not show an interest in seeking a patent on exendin-4 but did retain a royalty free license. Dr. Eng patented the drug himself and sought out drug companies. In 1996 he licensed the patent to Amylin Pharmaceuticals which called it AC2993. Amlyn and Eli Lilly and Company worked together to develop the drug. Ely Lilly negotiated a $325 million agreement in September, 2002 with Amlyn Pharmaceuticals for a right to develop and market a synthetic version of the compound. The Food and Drug Administration approved the “Gila monster” drug exenatide on April 29, 2005. The approved trade name is Byetta. In addition to Gila monster venom, there are many pharmaceutical derivatives from snake venom including : The Food and Drug Administration in 1998 approved a record number of new drugs derived from snake venoms. New drugs which include Integrilin and Aggrastat (from the Saw Scaled Viper) are synthetically produced disintegrins, which act as anti-blood-clotting agents. Aggrastat is effective in preventing heart attacks. Ancrod, from the Malayan pit viper is used in establishing and maintaining anticoagulants in heparin-intolerant patients undergoing coronary bypass surgery. Several snake venom enzymes are now being used in diagnostic testing. One, from the southern copperhead is known as Protac. Another similar drug is known as Reptilase used in testing blood. Captopril is a synthetic version used to lower blood pressure in patients suffering from a particular kind of blood pressure disorder. Amphibians and reptiles have been on the earth since the dim beginnings of time. They have been feared, worshiped, reviled, persecuted, admired, exploited, ignored, and by many people, relegated to an insignificant role in the world. Yet the dinosaurs were among the most successful of life forms living on the earth much longer than humans. Today more and more people are realizing that amphibians and reptiles, not only play a vital role in the ecosystems of the planet, they are vital to the survival of all our lives. No where is this better illustrated than in the continuing discoveries of the healing potential contained in the venoms of snakes and the descendants of the monstersauria. To summarize, one peptide from Gila monster venom has been synthesized as an insulin replacer in the treatment of Type II diabetes. Research is continuing on other peptides of the venom which may inhibit the growth of cancer cells, and improve memory, perhaps a treatment for alzheimer’s disease. “Lizard spit” truly has come from poison to promise. Sources include: “Biology of Gila Monsters and Beaded Lizards,” Daniel D. Beck, University of California Press, 2005. Contact: beck@cwuEDU and “Snakes, The Evolution of Mystery In Nature,” Harry W. Greene, University of California Press. 1997. Green iguana (Iguana iguana), originally uploaded by EcoSnake. Cold weather in Florida in January is causing non-native iguanas, which have been illegally released into the wild, to fall off tree branches onto the ground. An unexpected cold snap this week sent thermometers plummeting in Florida and heat-hungry iguanas dropping from tree branches like autumn leaves, scientists and witnesses said. Passersby in Bill Baggs and Crandon parks in Key Biscayne, south of Miami, were seen picking up the seemingly lifeless lizards from the ground beneath trees and setting them in the sun, where after a brief warm-up, most revived and scampered off into the bushes. The cold-blooded lizard-with-a-mohawk’s comfort level begins at 23 degrees Celsius (73 Fahrenheit) and it positively thrives at 35 C (95 F). But on Wednesday and Thursday, the mercury in south Florida dropped to 4-5 C (39-41 F). “When the temperature falls below about 60 F (15 C) they become less able to move around. At temperatures below about 40 F (5 C) they become completely immobile and begin to suffer serious stress,” said University of Florida wildlife expert Perran Ross. Since all three iguana species shelter in tree branches and crevices, he added, when the temperature falls low enough, they are unable to hold on and drop to the ground. 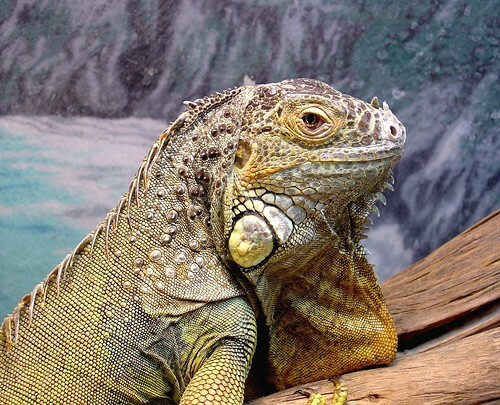 “Some of these chilled and cold-stressed iguanas will suffer irreversible damage and die. Others may be able to rewarm themselves by sitting in the sun and may recover,” the expert added. Iguanas are not native to Florida but were brought in by travelers from Mexico, Central and South America. A snake has been saved by surgery after mistaking four golf balls for a meal of chicken eggs, a veterinarian said Wednesday. A couple had placed the balls in their chicken coop at Nobbys Creek in New South Wales state to encourage their hen to nest, Australian Associated Press reported. They found the balls missing last month and a lumpy carpet python nearby. They took the 32-inch non-venomous snake to the nearby Currumbin Wildlife Sanctuary, where senior veterinarian Michael Pyne operated to remove the balls from the snake’s intestine. Pyne said Wednesday the snake was making a speedy recovery. “Those golf balls weren’t moving any further; they were stuck where they were,” Pyne said. “If it hadn’t been found, it would have died for sure,” he added.